What are we opening? The MeeGo distribution infrastructure and the operating system base from the Linux kernel to the OS infrastructure up to the middleware layer. The MeeGo architecture is based on a common core across the different usage models, such as netbooks, handheld, in-vehicle, and connected TV. The MeeGo common core includes the various key subsystems including the core operating system libraries, the comms and telephony services, internet and social networking services, visual services, media services, data management, device services, and personal services. More on this will be described on meego.com over the next few days. The downloaded images will boot from a USB stick or directly flashed on the device from your Linux PC, but since the MeeGo User Experiences for the usage models mentioned previously are not yet included in today’s MeeGo core, these images will boot into terminal. Clearly, this is not for consumer-level users, as there is seemingly nothing to do. However, this gives developers a first chance at interacting with the system and exploring the functionality of the operating system, short of developing graphical user interfaces. However, MeeGo is set for a May release, according to the blog post. Therefore, this seems like an ideal way to get developers familiar with the nuts and bolts of the operating system in time for its launch. 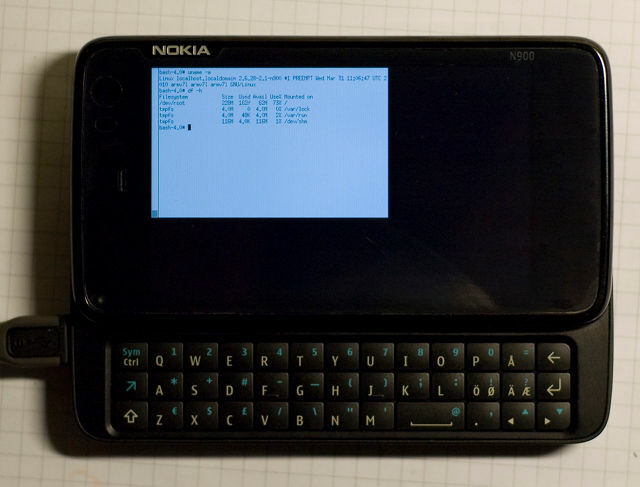 Downloaded images can be either booted from an external USB drive, or flashed on to the N900. If you’re interested in trying this out, look here for installation instructions.